Welcome to Hauser Jr.-Sr. High School! Hauser Jr.-Sr. High School serves approximately 462 students in grades 7-12. Historically, most students who have attended here are from families who have been in this area for generations; however, more recently, new families to the area are becoming a majority. The staff is a combination of veteran and young instructors, but, more importantly, of colleagues and friends. Families who are looking for a small, family-oriented learning community would find this institution ideal. 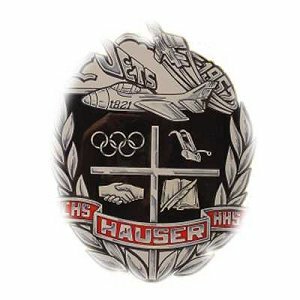 Though small and without the frills of many larger institutions, Hauser has demonstrated time and again the ability to achieve excellence in several areas. In the last five years, it has been recognized three times as one of the Head of the Class schools by the Indiana Chamber of Commerce. It also has also been given a bronze medal rating by U.S. News and World Report magazine for being one of the best buys in high school education three times in the last five years. In our accreditation organization, InSAI, Hauser has received the Top Gainer award three of the last five years for facilitating significant growth in the percentage of ISTEP tests passing. Hauser staff work hard to provide varied programming for students of all interests and needs. There are currently eight opportunities for dual credit through classes offered at Hauser over a dozen more opportunities through Early College and C-4 (our area vocational school). For those certificate of completion students, we offer opportunities for special programming with a career focus through our Work Study program and C-4 opportunities. We also offer pre-engineering courses through Project Lead the Way curricula. For those students interested in the fine or practical arts, Hauser boasts locally, state, and even nationally recognized programs in visual arts, agriculture, instrumental and vocal music, industrial technology, and family and consumer sciences. Finally, we have a 1:6 student-to-computer ratio and are competitive in the amount and types of technology we offer our students in a small school. Hauser is proud of its extra-curricular achievements, as well. Our basketball, baseball, softball, and volleyball teams have won at various levels of post-season play, including multiple sectional championships, some regional championships, three semi-state championships, and one state champion title. Also, several students have distinguished themselves inpidually in cross country, track, golf, and tennis. Our FFA has won a national and several state awards. Similarly, band and choir students have received numerous first place ratings at various contests. Our Inter-Disciplinary Academic Team received second in state competition most recently. Hauser is a small school with a progressive attitude. We hope you enjoy your perusal of our website and decide to visit us soon…if not join our school community. Should you need any further information, don’t hesitate to contact us.